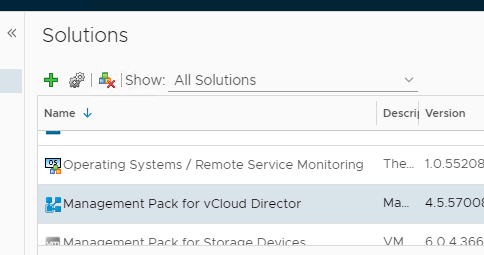 This is a nice little jewel available in the VMware Solution Exchange – ability to monitor vCD objects and provide potential tenant integration for monitoring their org. Click Finish once it’s complete. 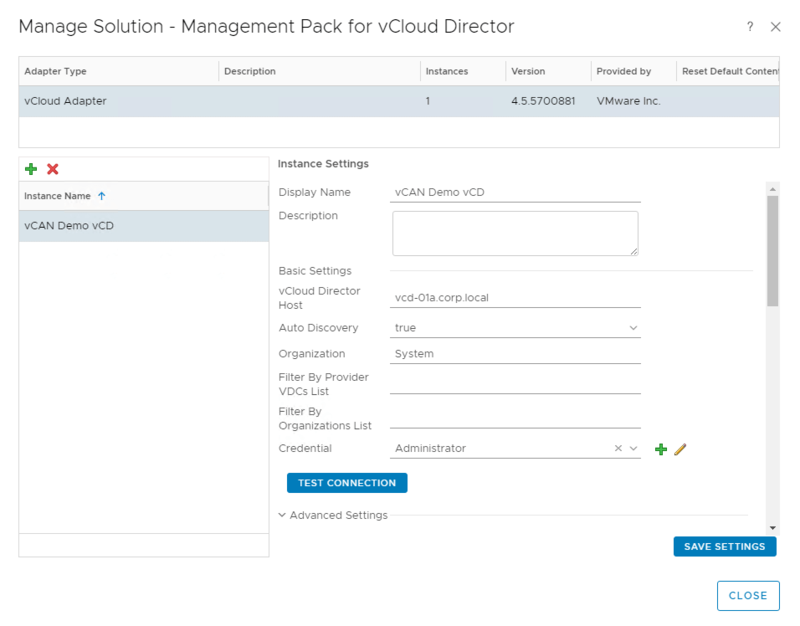 Now find the Management Pack for vCloud Director under Solutions. Go ahead and click on the gear icon to configure your connection. Add your instance along with the Display Name, org you want to connect to, and credentials. Pretty similar to other connections. Note – ensure Auto Discovery is set to “True” if you want new objects to propagate to vROps! Toggle over to Dashboards -> you will see several new vCD dashboard available from All Metrics, vApp Utilization, Alerts, etc. From here, one could provide tenant access to a specific dashboard and/or org from vROps that provides a vCD view. 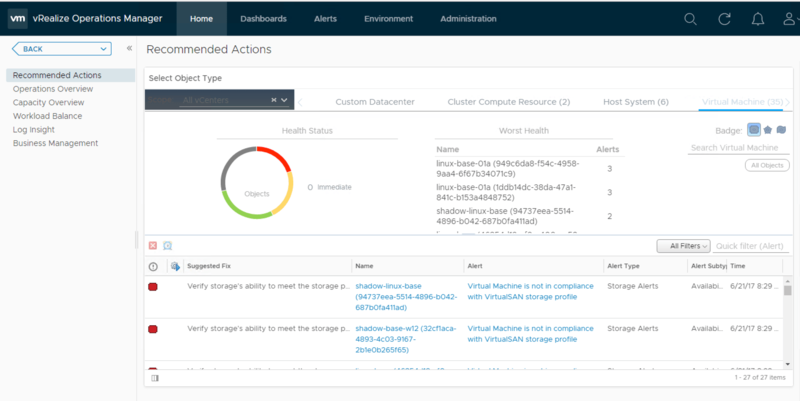 Yet another great addition for vROps 6.6 – definitely check it out if you are a vCD user! 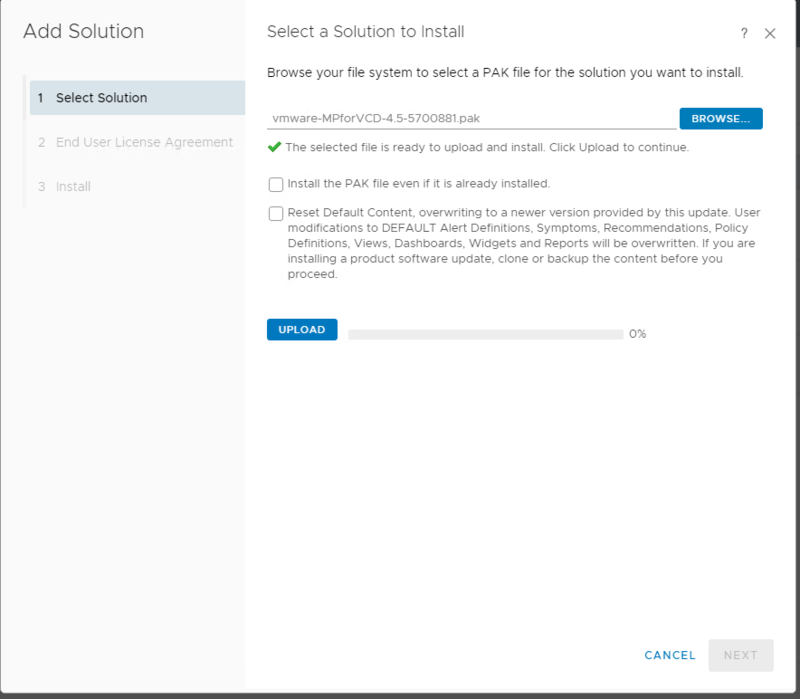 vROps 6.6 Upgrade – Easiest. Upgrade. Ever. I just upgraded my current vROps 6.4 instance to 6.6 – didn’t really know what it would take to do this. Well, I can say this was one of the easiest updates I’ve ever done. I can summarize this in five steps. 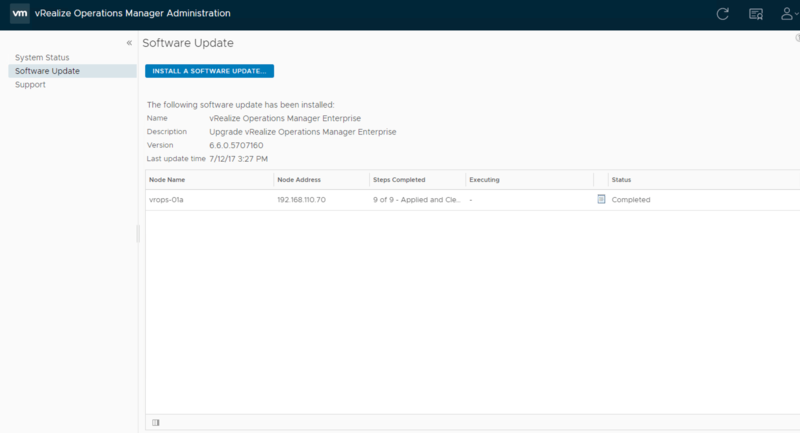 Download the appropriate PAK update file from vmware.com – there’s a few versions you can download. I’m running the vApp, so downloaded that. Sit back and let it do its thing. There’s 9 steps during the upgrade process. The admin page will time out during the appliance reboot. Once it comes up, the new GUI is evident. Once it hits 9 of 9 – click on System Status on the left. You’ll see your applicable nodes and the current state. I love the new interface, but also the immediate usability of 6.6. On the left side, I can see immediate recommended actions and workload balance. Just incredible for a “minor” release. Author Daniel PaluszekPosted on July 12, 2017 November 7, 2017 Categories VMwareLeave a comment on vROps 6.6 Upgrade – Easiest. Upgrade. Ever. I took the new 2v0-642 NSX certification on Tuesday and lo and behold, I passed! I am going to very careful so I do not violate any NDA, but I wanted to provide an updated perspective on the 2v0-642 test. As many of you know, 2v0-641 test has been around for several years and has been recently retired. Moreover, many of the study guides available are on 641 – my understanding is 642 was quite different. 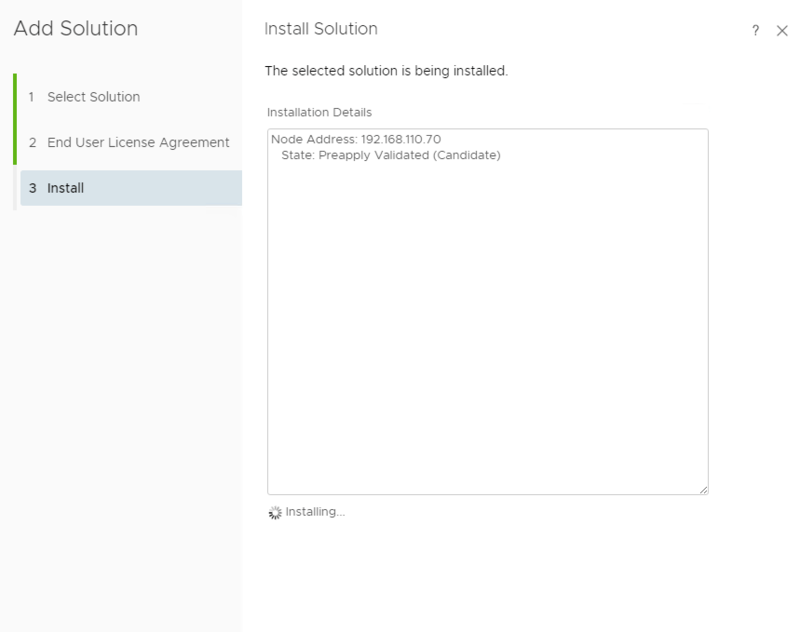 642 focuses on NSX 6.2x feature-set – one of the biggest changes is the addition of cross-vCenter vMotion. So what did I do to prepare for this? I took the VMware NSX for Internetworking Experts Fast Track [V6.1] Class. Yes, that’s right – I took the older class. Why? Well, I wanted to take a remote class and this was the closest thing available. I also don’t believe the Fast Track class is updated to 6.2, but I could be wrong. However, this was a VERY good class that laid out many of the fundamentals I needed. My instructor was good and even went over cross-vCenter vMotion and some of the changes for 6.2, which was not in the curriculum but very valuable. Moreover, when I take any kind of class, I screenshot EVERY slide and write notes the instructor states. I reviewed ALL of this material for my exam preparation. Labs, labs, labs. I can’t stress this enough – PLUS IT’S FREE!!! I used Gregg Robertson’s blog as an addition to my overview – I went through the podcasts but did not read the book he referenced. Many thanks to Gregg for this insight. READ THE DANG PRODUCT DOCUMENTATION! This can’t be stressed enough. 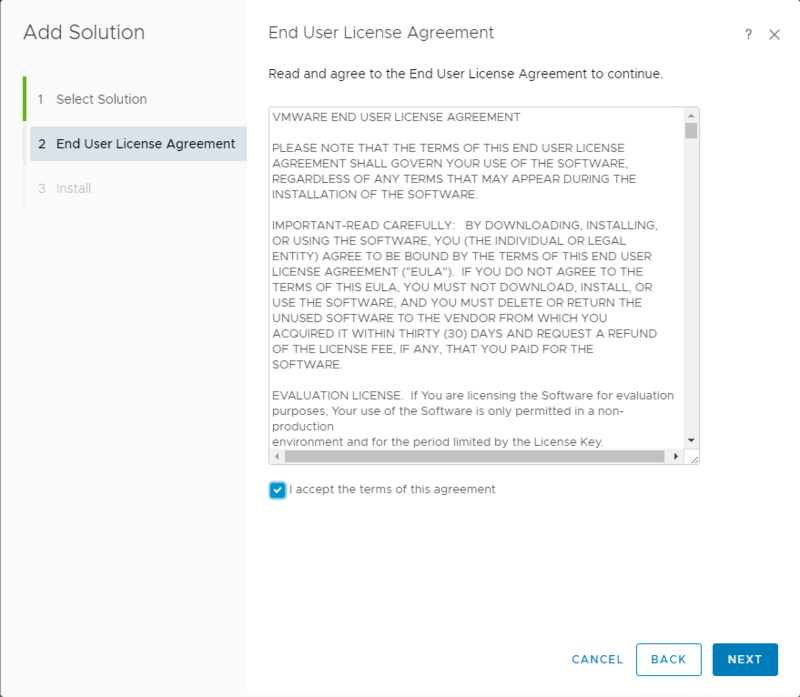 Even though it is long, some parts boring, there was some VERY VALUABLE insight, especially on the cross-vCenter vMotion setup and considerations. Furthermore, with the admin guides – I took the labs and went through the basic administrative functions so I’m aware of steps. This was good – but obviously take it with a grain of salt. You can’t just take this expect to pass the test. PLEASE take these notes as they are – it’s my (weird) way of studying for a test and how I interpret NSX. I went through the test and flagged questions I was not entirely sure. First pass took me maybe 35 minutes to complete – then I went to the beginning and went through the test again, focusing on the flagged questions I wasn’t too sure of. Read each question CAREFULLY and eliminate the ones you know aren’t true. Overall, I think I finished up with 45 to 50 minutes to spare. Overall, I thought the test was challenging and asked very fair questions. It also made me kick myself on things I should have reviewed further – but that’s what a test is! I’ll be working on my VCAP next – TBD if I’ll switch over to DCV or stay on NV. But I truly enjoyed the experience and look forward to the next test preparation. Thank you for visiting my new fangled blog. I’ll be discussing quite a few things in the tech and firearms industry. 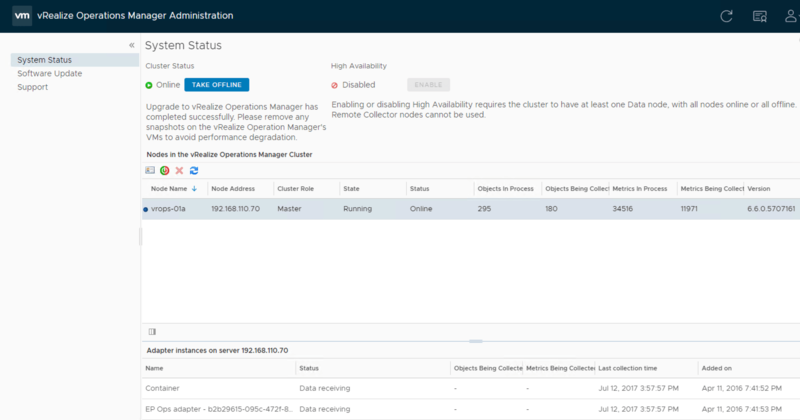 Stay posted for a vCloud Availability for vCloud Director post soon – getting quite a bit of exciting feedback. I also recently passed my VCP6-NV so I’d like to discuss my study curriculum and what I believe it took to pass the test. Author Daniel PaluszekPosted on June 30, 2017 Categories UncategorizedLeave a comment on Welcome!